Masala Paniyarams- A tasty snack made from left over Paniyarams, stir fried to make them crispy, garnished with coconut and coriander to give them an added flavour. 1. Cut the paniyarams in to quarters. 2. Heat the oil in a wok, when hot add the mustard seeds, urad dhal, red chillies and curry leaves. 3. Once they start to splutter add the sesame seeds and paniyaram pieces. 5. Transfer to serving dish, Sprinkle with grated coconut, chopped chillies and fresh coriander. NB- I used left over methi paniyarams from the previous days meal. Spicy Lounge-COL left over delicacies event. wow.that's so tempting. Thanks for sharing this lovely recipe dear.Nice click too. Masala paniyaram looks really yummy. 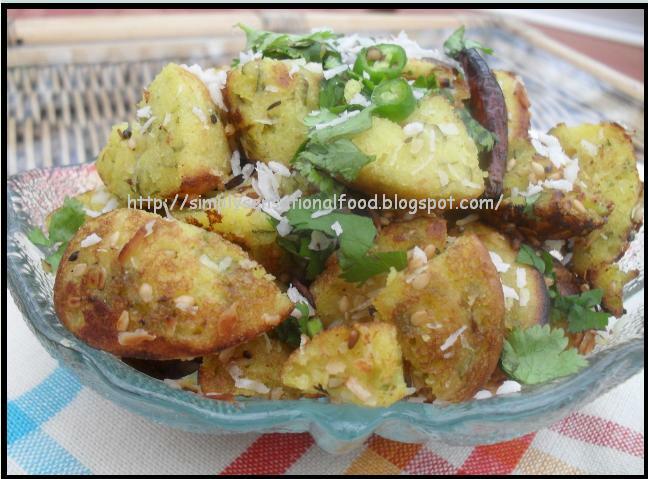 Looks so delicious..nice way to use leftovers..
Nice idea.........that too we have leftovers. good variety Nayna. I still have your old link bookmarked, once I have appam pan, I will surely make these. Nice recipe and love ur paniyarams too !! Wow..great idea.very colorful and soo tempting..
Wow, Nayna masala paniyarams looks fantastic, wat a brillant idea..thanks for sharing.. I have never had paniyarams..Masala paniyaram looks delicious..
ooooo Nayna...those look too yummy!!! Paniyarams look nice, easy and healthy snack. Paniyaram looks great dear n makes me hungryyy ur paniyaram,,its beeen long time i had paniyaram,,,rombha tempt pandreenga pa..
Looks lovely. Nice way of using left overs. This snack can be relished with evening tea. great creative handy idea! thanks ! Looks tempting, my mouth is watering! The masala looks a little similar to Dhokla that we make. Simply wonderful recipe . I generally wait for such recipes which are unique to me. Thanks for sharing. Brilliant variation to the otherwise brilliant PANIYARAMS..... I loved this yummy twist..... Kudos!!!! Nice idea, looks great and yummy.